Former New Orleans Baptist Theological Seminary trustee Bill Bailey guides a bag of debris as it is pulled from the ancient water system at Gezer, Israel, part of the ancient Canaanite city-state society. 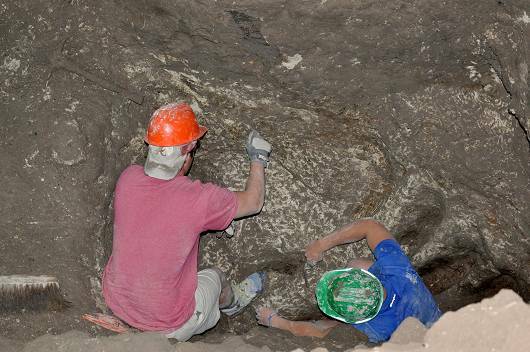 The summer dig aimed at determining the date of the tunnel system was conducted by members of NOBTS' Moskau Institute of Archaeology and the Israel Nature and Parks Authority. Photo by Gary D. Myers. Amy Brogan sorts and marks pottery found in the pool area of the Gezer Water System. Archeologists hope to determine the date the water system was laid in the ancient Canaanite city. Photo by Gary D. Myers. John Canada, left, and Brian Mooney clean the floor of the pool in the Gezer Water System on a dig with members of the New Orleans Baptist Theological Seminary's Moskau Institute of Archaeology and the Israel Nature and Parks Authority. Just left of Canada is a portion of "Macalister's Causeway," a series of stones laid over the pool area by Irish archaeologist R.A.S. Macalister in late 1907. Photo by Gary D. Myers. R.A.S. Macalister faced a crucial decision in late 1907 when he reached the bottom of the ancient Gezer Water System in Israel -- drain and excavate the pool at the bottom step or explore the cavern beyond the pool. He chose to bypass the pool and excavate the cavern. Macalister had no way of knowing the implications his decision would have on establishing a date for the system. Now, more than a hundred years after Macalister's dig, a reexcavation of the water system by a team of archaeologists from the Moskau Institute of Archaeology at New Orleans Baptist Theological Seminary and the Israel Nature and Parks Authority (INPA) is bringing the implications of Macalister's choice into clear focus. Leaders of the NOBTS/INPA dig believe Macalister's choice preserved valuable data that will help establish a date for the tunnel's construction. This summer, the team began excavating the pool area searching for datable material and the water's source. In Macalister's early 1908 quarterly excavation report, he presented a detailed explanation of the water system and explained his decision to move on to the cavern, calling the excavation of the pool "a difficult, expensive and (from the archaeological point of view) profitless task." To facilitate the crossing of the pool area, Macalister laid a "causeway" of stones, effectively sealing the ancient content below. Late in the 2012 dig season the NOBTS/INPA team discovered a layer of white chalky stones which had blended together and covered most of the pool surface. Archaeologists are certain the layer is Macalister's causeway. "For us this was a gold mine," said Dan Warner, associate professor of Old Testament and archaeology at NOBTS. "When Macalister laid the causeway over the water pool, he preserved for us everything underneath from further contamination and other intrusions from his excavation." When NOBTS and INPA began reexcavating the water system in 2010, establishing a date for the system's construction was the foremost goal. Several dates for construction have been proposed over the years. Macalister believed that the water system is a product of the Middle Bronze IIB period during the height of Gezer's influence as a Canaanite city-state. Others attribute construction of the system to Late Bronze Age Canaanites. Another prevalent view attributes construction to the Israelites during the time of Ahab. The difference between the earliest and latest dates for construction is around 800-900 years. The team went into the three-week dig season in May and June determined to find the bottom step of the water shaft and systematically excavate the area under the causeway. Most of the first two weeks of the dig were spent searching for the bottom step and cleaning Macalister's causeway. Tons of debris and rocks were removed in the process. When the bottom step was located and the causeway area clear, the team excavated three probes in the pool area. The material encountered below the causeway was bagged and pulled from the water system by a crane. Once on the surface, volunteers sifted the wet silty mud using wire mesh screens and water. The probes yielded large amounts of broken pottery shards, charcoal samples and other ancient material. The dig's directors are confident pottery from the water pool will yield an approximate date for the construction of the water system. After preliminary reading of the pottery in the field, the shards and others items were transported to pottery experts for further analysis. A separate lab will examine and establish the age of the charcoal samples. Macalister's discovery of the water system was an important step in understanding the ancient city of Gezer and its inhabitants. He produced detailed descriptions, drawings and measurements of the system, offering the NOBTS/INPA team valuable data for planning their dig. But in many ways, Macalister's excavation work in the cavern was ultimately a disappointment, according to archaeologists. The cavern probes yielded little ancient material and shortly after Macalister completed his cavern probes, torrential rains sent all the rocks, dirt and debris his team had removed back down into the water system, archaeologists said. With the system backfilled, Macalister moved on to excavate other areas at Gezer.